Usually we use a battery level indicator along with rechargeable battery to monitor the voltage level. If the Lead Acid battery is deeply discharged below a particular voltage level ,Memory effect develops and the battery never attains full charge later. So it is necessary to monitor the safe voltage level in the battery. A 12 volt Lead Acid battery shows 13.8 volts in fully charged condition and it should not deep discharge below 9 volts. If it happens, immediate charging is required to maintain the health of battery. 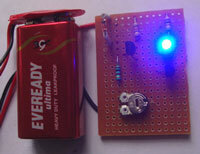 You can add this Simple Battery Monitor to Inverter circuit or Emergency Lamp circuit to indicate the level of battery. It can be used to monitor 6 volt or 12 volt battery. Two LED indicators are provided. Green LED lights, if the battery voltage is higher than the set level and Red LED lights when the battery voltage drops below the set level.